Santa Clarita Water Conditioning : F.A.Q. The term hardness refers the quantity of dissolved calcium and magnesium in water. These minerals, which come primarily from limestone type rock formations are found to some degree in almost all natural waters. Calcium and magnesium cause problems for two principal reasons. When the water is warmed, they precipitate out of solution and form a hard, rock-like scale. This scale accelerates corrosion, restricts flow, and reduces hear transfer in water heaters and boilers. When they combine with soap, they react to form a curd, which interferes with cleaning, dries out skin, and leaves deposits on plumbing and clothes (bathtub ring; ring around the collar). The minerals in hard water gradually settle out forming a hard scale. Scale centimeters thick can build up over time in hard water areas. Scale build up will eventually clog pipes, and can decrease the life of toilet flushing units by 70 percent and water faucets by 40 percents according to a report published by the American Water Works Association (AWWA). Hardness scale can also shorten life of washing equipment, dishwashers, and clothes washers by as much as 30 percent according to the AWWA report. Chloride is one of the two components of the two components of common table salt, sodium chloride. Scientifically it is known as the negative ion of chlorine. Chloride is also one of the two components of anther common form of sodium chloride, rock salt. Why is chloride bad for water? Too much chloride in the water can damage agricultural crops by causing leaf burn or drying of leaf tissue, thereby reduce crop yields. It also can harm aquatic life. Most major utilities in California use chloramines as the drinking waster disinfectant. In Southern California, cities like Los Angeles, San Diego, Burbank and Long Beach have converted to chloramines. In fact, the Metropolitan Water District of Southern California has used chloramines since the mid 1980s. Why did the CLWA convert to chloramines? The Castaic Lake Water Agency (CLWA) converted water disaffection treatment from chlorine to chloramines in order to meet national surface water standards required by EPA. The changeover in the treatment process will took place on April 15, 2005. The conversion was approved by the California Department of Health Services (CDHS), which oversees compliance with federal requirements of the Safe Drinking Water Act. What are the benefits of converting to chloramines? What are the drawbacks of chloramines? What are the hidden dangers of a morning shower? Chlorine: Added to most municipal water supplies, this disinfectant hardens arteries, destroys proteins in the body, irritates skin and sinus conditions, and aggravates asthma, allergies, and respiratory problems. Chloroform: This powerful by-product of chlorination causes excessive free radical formation (accelerated aging! ), normal cells to mutate, and cholesterol to oxidize. It's a known carcinogen! DCA (Dichloro acedic acid): This chlorine by-product alters cholesterol metabolism and has been shown to cause liver cancer in lab animals. MX (another chlorinated acid): Another by-product of chlorination , MX is known to cause genetic mutations that can lead to cancer growth and has been found in all chlorinated water for which it was tested. What is a whole house water filter? A whole house water filter, also known as a point of entry filter, is designed to filter all the incoming water to your home. 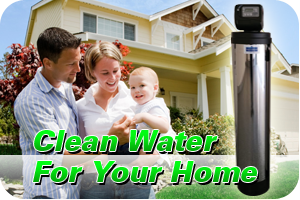 Facts and Benefits of a whole house hydro magnetic activated carbon water softener? - You absorbs more chlorine in a 10-minute shower than by drinking 8 glasses of water! - Totally reduces chlorine taste and odor. Why can't the existing water treatment plants remove the chloride? They can be modified, but the treatment needed (micro filtration and reverse Osmosis) is very costly. It will cost the Sanitation Districts and its customers more than $ 300 million to construct additional treatment to remove chloride from wastewater if the amount of chloride entering the sewers is not reduced by residents. Approximately 50 percent of this expense is due to the cost of installation of a 46-mile pipe (brine line) to take the salt waste produced during treatment to the ocean and the installation of a three-mile underwater pipe at the ocean. What do I need to know as a business owner? If your business is currently operating a water softener that regenerates on-site, you must immediately stop discharging brines from the unit into the sewer. If you put salt in your softener of pay a water conditioning service to add salt to the softener, then your softener regenerates on-site and can not be hooked up to the sewer. If someone changes out the tank in your softener on a regular basis, then you have an exchange tank system and can continue to use it. The Sanitation Districts' inspectors already inspects local businesses to ensure that no self-regenerating water softeners are connected to the sewer and will continue to do so. What if I like my water softener? Can I keep it? No. 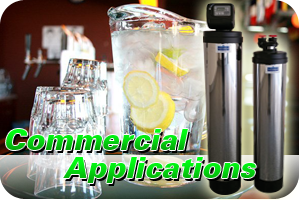 However, the Sanitation Districts have passed ordinances that prohibit new installation of automatic water softeners. They also have launched an outreach campaign asking all automatic water softener users to unplug their machines today. If your softener breaks down, you cannot install a replacement-you'll have to find and alternative. you also cannot transfer you system when you move within the Santa Clarita Valley. Residents who violate the new ordinances banning the installation of self-regerating water softeners will be subject to a fine of up to $1000 and/ or imprisonment not to exceed 30 days. Can I divert brine waste from the sewer system by installing a drain line into my yard? No, we do not recommend irrigating with brine waste, even if you use potassium chloride in your water softener. Irrigation with brine waste requires a permit from the Los Angeles Regional Water Quality Control Board, and such permits are costly and difficult to obtain. If I still have questions who can I talk to? If you have any further questions about the ordinances or want more information about your choices, you may cal the Sanitation Districts toll-free at 1-877-cut-salt or visit their chloride web site at www.lacsd.org/chloride. Environmentally friendly for the Santa Clarita Valley. 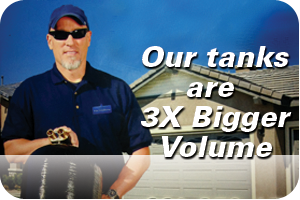 Our tanks are 3x bigger in volume, giving you more for less. 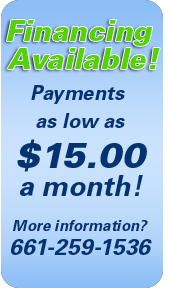 Give us a call to schedule soft water tank exchange.